Geoffrey Squire (1923-2012) was a portrait painter and lecturer whose creative instinct never stilled. From classroom to art college, war service in the Fleet Air Arm, his own studio or doodling on pub napkins, his pencil was rarely idle, latterly sketching quirky caricatures of the nurses from his hospital bed. His was an innate enthusiasm for his craft and one that helped to nurture some of the country's most celebrated artistic talent – John Byrne, Alison Watt and Stephen Conroy – through an academic career spent entirely at Glasgow School of Art. The son of a banker, he was born in Cleckheaton, West Yorkshire, and was educated at Heckmondwike Grammar, winning a scholarship to Leeds School of Art. It was the first of several scholarships that saw him study at the Ruskin School of Art at Oxford University and then Slade School of Fine Art at University College London. The war was at its height during his studies and, after being involved in fire spotting while he was at Oxford, he volunteered for the forces, joining the Fleet Air Arm. He was a telegraphist and air gunner, initially on Swordfish aircraft with 830 Squadron and later on Barracudas. Much of his service was with 812 Squadron off the aircraft carrier HMS Vengeance. He also spent time in Malta where he returned with his Barracuda pilot and navigator decades later, thanks to a lottery grant. Squire, who was a man of great strength and a highly-respected athlete – a cricketer, rugby player and heavyweight champion boxer in the forces – was regarded as a great asset to his crew because, as a strong swimmer, they were confident he could save himself and rescue the two others in the event they all ended up in the sea. Fortunately, however, his turned out to be a fairly uneventful war and he even managed to spend some of it sketching aircraft. At the end of hostilities the carrier was due to sail to Australia but somehow he wangled his way out of that voyage and managed to hitch a lift back home on a different ship, getting demobbed sooner than the rest of the crew and resuming his studies which he completed with great distinction. He was immediately offered a post teaching drawing and painting at Glasgow School of Art, came north in 1947 and never looked back. He eventually became a senior lecturer and worked alongside colleagues including David Donaldson, Her Majesty's Painter and Limner in Scotland. At one point, each year's intake of students was allocated to study under either Donaldson or Squire. Meanwhile he continued his private work, primarily as a portrait painter. Though he was an incredibly versatile artist, having originally studied sculpture, he worked mainly in oil and latterly acrylic. His work is in private collections worldwide as well as in the Royal Scottish Academy, the Royal and Ancient Golf Club in St Andrews, New College, Edinburgh and in the collection of Princess D Maria Cristina, Duchess of Braganza. He was commissioned to paint a miniature of Charles the 1st of Portugal and was awarded the Order of Charles the 1st by a branch of the Braganza family. He also produced many self portraits. In July 1952 he married one of his students, Jean Parlett, and they lived in Glasgow for many years, firstly at Queensborough Gardens and then Oakfield Avenue, before discovering Elie where they moved in 1971. 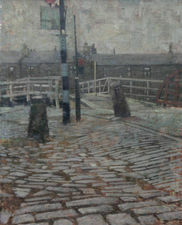 Squire would spend three or four days a week in Glasgow, sleeping in his studio at the art school before returning home where he also had a studio. He also spent a sabbatical year painting in France where he was inspired by the landscape around Marcilhac sur Cele in the country's south-west. After retiring at 66 he served as a governor of Glasgow School of Art from 1988-1990. Among those who sat for him was Sir Malcolm Innes of Edingight, formerly the Lord Lyon, and Squire recorded a coat of arms at Lyon Office. They featured a swan and a rose reflecting his Yorkshire roots along with the motto Natura Potentior Ars – Nature's Art is Better.